This set of Acrylic Planner Stamps is ready, set, go. 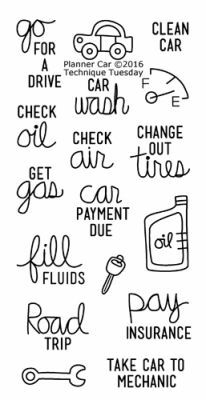 Whether you have a new set of Wheels or taking care of your existing Wheels -- use this Planner Stamp Set to make a note of your maintenance or Road Trips. Acrylic Stamp Block is NOT included. Stamp Set by Technique Tuesday.